Minis and breasts – the next business? Isn’t fascinating the ideas people have to set up their own business! And recently I have discovered 2 people that have taken something that they have and turned it into making income – one with their Mini and the other their breasts – or should I say – their breast milk!! Robert Welch left University with the aim to be a high flyer in the finance world – two days later Lehman Brothers collapsed and thwarted his plans. Job interview after job interview with no avail, he was getting very frustrated. Whilst waiting for his next interview for a 100% commission sales role that he didn’t really want, he chatted to one of the other candidates. They ended up in the pub to drown their sorrows, got chatting, and it turned out the both of them owed an old mini. Living in London, Robert loved to zoom in and out of the traffic and would notice that people would stop and wave at him in his little green mini. He had a spark of an idea that running mini tours in London would be great fun. He shared this with the chap in the pub and www.smallcarBIGCITY.com was formed. I met Robert recently as my sisters had organised one of his “Italian Job” Tours for me in his little green Mini. We had to don the bright blue overalls and tweed caps, was given the gold bar (which I promptly dropped) and then hopped in the car and zoomed round the narrow streets of London, from the City, to Borough Market, along the Thames to Parliament Square, ending up at The Langham Hotel…and that’s another story. 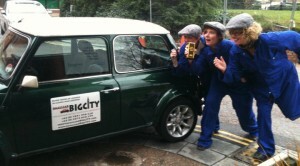 I can highly recommend smallcarBIGCITY; great fun, very informative and what an entrepreneur! The other person – I haven’t met, but read about in BBC news is Victoria Hiley. She gets £15 for every 10 ounces of her breast milk she donates to a Covent Garden restaurant. They then pasteurise this, add Madagascan vanilla pods and lemon zest and turn this into ice cream – which they’ve called Baby Gaga and serve with a rusk! One side of me thinks – good for her – being creative and thinking of a way to make some money – mind you – not a long-term project. On the other hand – it reminds me of Little Britain and Harvey demanding “bitty”. Does give me a shiver! At the moment, Westminster Council officers have removed the product so that they can ensure it is “fit for human consumption”. The restaurant have had over 200 women offering their milk – so I wonder if this will take off and we’ll have not “Mr Whippy” chiming down the lane, but “Mrs Bitty” in a cone and chocolate flake. So – what do you have that you can turn into a business? What is sitting there at home that has income potential? You may not have breast milk, but what about your expertise?